If static electricity poses a significant problem in your manufacturing environment, take action by choosing TIVAR® ESD or TIVAR® EC. With a surface resistivity range of 105 to 109 (ohms/sq) TIVAR® ESD handles tough conditions where dust and static electricity can cause problems. TIVAR® ESD is an ideal material to use when potentially volatile conditions exist, such as those in grain elevators and munitions plants, effectively safeguarding against static discharges. In addition, it resists heat and protects robotics and other products that are sensitive to dust accumulation and electrical charge buildup. Where you need the material to be conductive, TIVAR® EC provides a surface resistivity of <105. Both Black TIVAR® ESD and TIVAR® EC are available in two standard sheet sizes: 48" x 120" sheets with gauge sizes ranging from 1/16" to 6"; 60" x 120" sheets with gauge sizes ranging from 3/8" to 1". TIVAR® ESD is also available in rod, board, tube, tape and profiles. 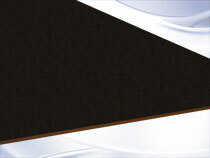 TIVAR® CleanStat™ available in 48" x 120" sheets with gauge sizes ranging from 1/4" to 3". It is also available in specific tube and rod sizes and custom fabricated parts.